Since our chartering in November 1957, the Dallas Chapter of The Links, Incorporated extended the chain of friendship and service to others not only in our community, but both nationally and internationally. We are proud to be included in the over 14,000 women from 281 chapters located in 41 states, the District of Columbia, and The Commonwealth of the Bahamas, that are “Linked in Service, Connected in Friendship”. 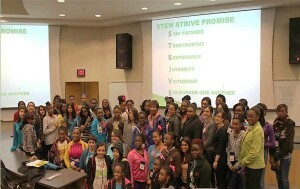 With a mission to provide innovative service that transforms our community, the Dallas Chapter developed a STEAM (Science, Technology, Engineering, Arts and Mathematics) Academy for girls 7th through 12th grades. We provide services in five facets, Services To Youth, The Arts, National Trends and Services, International Trends and Services, and Health & Human Services. The academy experience includes classes that incorporate interactive, hands on activities, conversations with professionals currently working in STEAM fields, life skills training, mentoring and field trips. Students are also encouraged to participate in the signature programs of the Dallas Chapter that include the MLK Senior Center Christmas Card Activity and the Get out the Vote Initiative.